Let’s not waste this opportunity…. Recently I spent a morning with the waste collection team at our Moorhey Street depot. Our waste and recycling crews have a tough job and I’m grateful they could spare some time to talk me through how the service operates and the challenges the borough faces in collecting and disposing of our waste. The team deliver what is probably our most high- profile service – used by every resident and many of our businesses. Every day our team of 28 bin trucks collect around 40,000 bins from across the borough – heading out before most of us are awake and whatever the weather. The UK as a whole generates around 200 million tonnes of waste every year. The majority is sent for landfill. In Oldham each household produces around a tonne of waste every year with 40 per cent being recycled. This is a figure we are always looking to improve on. Over the last few years we’ve worked hard to reduce the amount of waste we produce as it costs us £290 per tonne to send for disposal – money that could be used to fund services elsewhere in the borough. The team talked me through their ‘changing behaviours’ work – where they work with residents in neighbourhoods to improve how local people use the service (putting bins out correctly and recycling where they can) and to take action where residents dump waste or routinely put waste in the wrong bins (which costs us more as the waste has to go for disposal. • 3,560 people spoken to and educated regarding their waste disposal and its impacts. • 2,000 more recycling bins delivered. • 1,281 more Fixed Penalties served for littering and dumping. • 66 prosecutions for fly tipping and dumping (i.e. more serious cases or where people have not paid their fines). 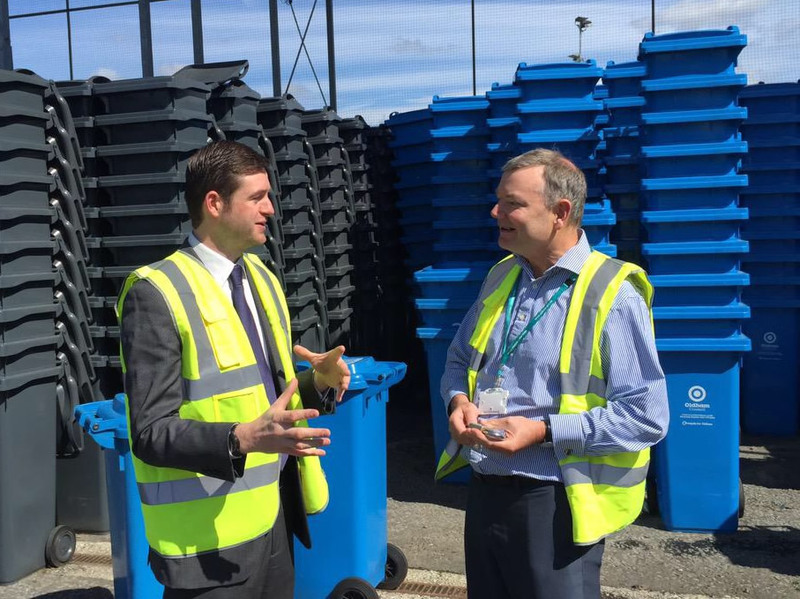 Overall this has led to a 10 per cent increase in recycling in targeted areas and a significant decrease in fly tipping too. This not only means we have more resources to spend on services at a time when the council is having to reduce its budget by half, but also that local areas we know and love look cleaner. We are by no means finished and there’s still a way to go before Oldham is the clean and safe borough residents deserve, but it’s a great start. Thanks again to the Moorhey Street depot staff and indeed all our refuse service for making my visit so informative and keeping our town clean daily. 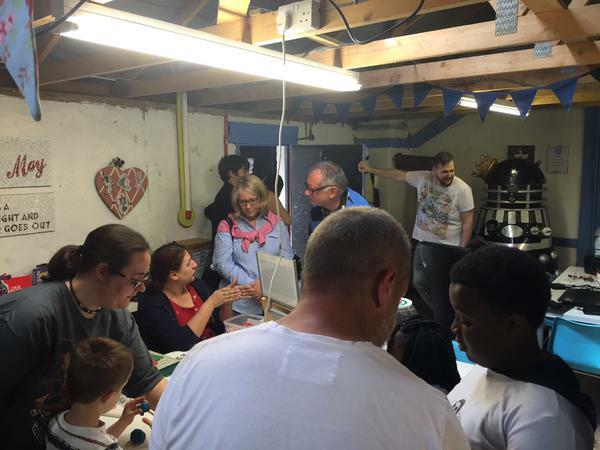 HACKSPACE: Opening Oldham’s exciting new community enterprise with Andy Powell in Hardcastle Street (off Yorkshire Street). FIRSTLY, I’d like to thank the many residents, business and council staff who sent me such kind messages after the Queen’s Birthday Honours list came out last Friday night. It’s extremely humbling to have been awarded an OBE in amongst the great and good across the country, and you can read my initial reaction here. 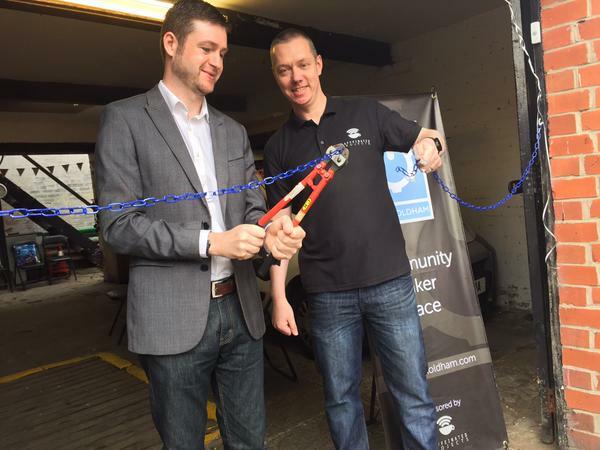 On Saturday afternoon it was straight back to business when I attended the opening of a new community enterprise called Hack Oldham in the town centre. Before getting there I had in my mind the idea that I was going to see a team of busy IT enthusiasts working in a cool, imaginative space: a little like a mini ‘Sharp Project’, I suppose. I certainly wasn’t expecting what I then discovered and it had much more of an effect on me than perhaps the organisers would have imagined. Firstly, there are plenty of IT hobbyists, entrepreneurs and creative people around, but what was impressive to see here was the application of technology to everyday problems. The workshop setting wasn’t a clinical laboratory. It was a proper old school workshop complete with wooden benches, power tools and things were being made. And old world met new world as in the next room a row of 3D printers were busy creating a scale topographic model of Oldham! WORKSHOP: Hack Oldham is a proper old school workshop buzzing with ideas and energy. I was really inspired by the creativity in that little workshop and the fact that here is a new community space, run by the community, and for the community. During the opening event – not, of course, a standard ribbon cutting, but bolt cutters and a chain across a workshop door – I put the case across not for them just to make stuff, but to change the world. We’ve innovated here and done it before and there’s no reason why the next world changing invention couldn’t come from Oldham once again. But I also started to ponder something else that day. Are we (Oldham Council) ready for a new town centre community? Are we ready to allow others to put their own mark and personality on an area that has previously been slightly ‘off the shelf’? I say that because I’ve been around long enough to know that when councils commission creative types it is invariably an expensive project and – although artists will attempt to interpret Oldham – unless they live and breathe the borough it will never ‘be’ Oldham. With the Independent Quarter fast beginning to take shape after more than year of hard ground work from our staff, we are now seeing a real community developing of mainly borough residents who believe in the place, have a great deal to offer and want to play their part. A stroll through Manchester’s Northern Quarter reveals not a crisp modern city, but an individual character formed by those who have adopted it. The use of the buildings, the type and feel of the restaurants and quirky urban art creates a real sense of place – but it certainly couldn’t be described as clean and crisp. With the potential not to recreate the Northern Quarter here – but something from and of Oldham – these are exciting times for the Yorkshire Street area and its emerging community. I believe we need to think hard about how much are willing to allow it to develop its own personality organically – rather than picking out a showroom from an urban design catalogue. I can tell you that’s a real leap of faith, but one which could pay dividends. OUR HOUSE: This is the interior of the country’s first high street weekly store for new household goods at the lowest cost -and it is open now, right here in Oldham town centre. IT’S BEEN a long time coming but finally there is an ethical alternative weekly payment store – a national first – and it’s right here in Oldham. What you won’t know is that this hasn’t just happened by chance: and nor was it ever going to. The idea started as we looked forward from our two flagship fairness campaigns – Fair Energy and Fare’s Fare (Bus Fares): which made a real difference to the lives of thousands of residents. When we asked local people what other things affected them and the financial wellbeing of their families they told us that access to affordable credit and being trapped in cycles of debt and penalty fees were huge issues. So we set out on a very different route to the traditional method of just creating a leaflet advising local people on managing their finances (okay, we did do that as well!). Instead we were more realistic and accepted that, for some people, paying for goods on a weekly basis was right for their needs. And providing they could afford the repayments then there isn’t anything instinctively wrong with that. But we were also looking here at a market which isn’t regulated anywhere near as hard as it should be and one which, for too many people, is expensive and could trap them into a cycle of debt they may never get out of. We didn’t think that was right and we wanted to do something practical about it. 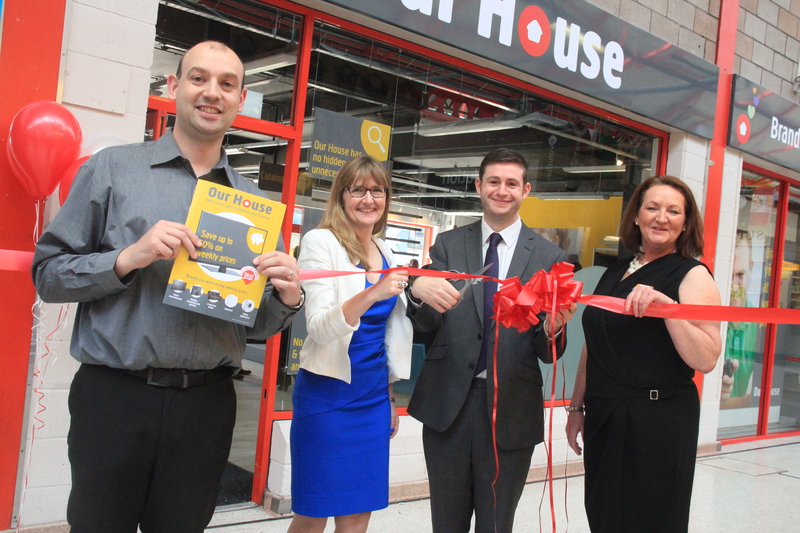 “We are delighted to announce the opening of the country’s first high street weekly payment store for new household goods run by a social business in the centre of Oldham. 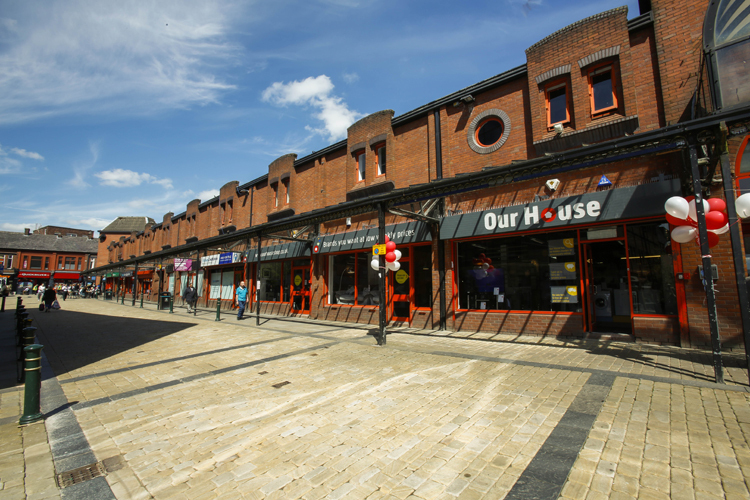 Our House Oldham, now open on Albion Street, outside Tommyfield Market, has been created by FRC Group, a not-for-profit business, working in partnership with Oldham Council. This is a completely new type of high street store, a weekly payment store offering a great range of new household furniture, appliances and electrical items, with all the brands customers want and at the lowest cost. The weekly prices at Our House are up to 50 per cent cheaper than other high street rent-to-own stores, offering huge savings and with no late fees. There are also no hidden charges or unnecessary extra costs – no expensive service package and insurance is truly optional. At Our House we want our customers to spend less money and we are here to help them to save as much as we can. We are also employing local people, including an apprentice, and offering a great training and development programme. FRC Group was created more than 25 years ago to help low income families get furniture and help long-term unemployed people back into work. While social enterprises must reinvest 50 per cent of their profits back into their business to fulfil their social mission, FRC Group reinvests 100 per cent. We have no shareholders, and we are also a charity. Our top aim is to offer the best value for our customers, not to make profits for ourselves, so we have kept our prices as low as we can and will continue to work hard to drive them down even further. We sell new furniture to social landlords through our social business Furniture Resource Centre, and we run Bulky Bob’s, which reuses and recycles items collected through bulky household waste contracts with local authorities, including Oldham Council, giving away and selling furniture at low prices to those who need it. But we understand that some families are not in furnished accommodation and some people do not want preloved or second hand furniture. Families who cannot save the money to buy new furniture or appliances, or who find it hard to get credit can get into major debt by turning to money lenders or rent-to-own businesses with very high interest rates and a range of hidden charges. That’s why we worked with Oldham Council to create the Our House store because they understand that a growing number of people are turning to expensive sources of credit, and even loan sharks, in order to buy necessities like household goods. Many people do not have bank accounts and have a poor credit history, which reduces their options and puts them at greater risk of financial exploitation. Our House offers a fair credit solution, giving access to reasonably priced credit, keeping the total cost realistic and affordable. The new Our House store is based at Unit 6-8 Albion Street, Tommyfield Market, Oldham, OL13BG, and it is open Monday to Saturday, 9am to 5pm, (opening at 9.30am on Tuesdays). YOU MAY have already heard that the leaders of Greater Manchester’s ten councils met last week to appoint an Interim Mayor. It was a long and involved process and I believe genuine efforts were made to try and be as open as possible in making what is an appointment for a temporary position, rather than an election by public vote of a full-time Mayor. I have put on record before that I believe more time should have been allowed by government for there to be an early public debate about this new role and devolution from Whitehall to Greater Manchester. But I do strongly believe that the case is compelling and that the opportunity to be the masters of our own destiny is far better than us being told what to do by civil servants in London. Oldham’s voters haven’t been exposed to a referendum on whether or not they support the idea of a directly elected Mayor. Some people who are against the idea of elected mayors wrongly say that “Greater Manchester rejected a mayor” but they are, of course, referring only to the City of Manchester and some other boroughs. The truth is that there hasn’t been a vote across the whole of Greater Manchester on the introduction of a GM Mayor. This does also pose a big question for the rest of the country. It can’t be acceptable for the Chancellor to say that the ‘old way of doing things is broken’ and then only allow a new system for some parts of the country. Even in areas where city or county deals have been struck there is little logic in the packages being offered – a result of the closed deal making which has been the hallmark of devolution under this Government. But I’m also a pragmatist. I’d sooner have a directly elected mayor agreed through a negotiated package of devolution without a public referendum than just refuse the new powers. The offer on the table is significant and it shouldn’t be underestimated. It is likely there will be limited room for the Interim Mayor to really get things going because, understandably, the public and other elected councillors will want to see who comes forward for the elected position. With an engaging debate and election period to come – including a good spread and calibre of candidates across all parties and interests – that could help to build public support and accountability. But there is also a real job to do now – and it is vital that we get it right. Not all powers which are due to be devolved will be handed to the Interm Mayor. Health devolution for instance – which makes up the vast majority of public spend – is being devolved to the Greater Manchester Combined Authority and to each of the ten local councils. Ensuring the attention to detail, partnership and true buy in from each area will be critical to our shared success. 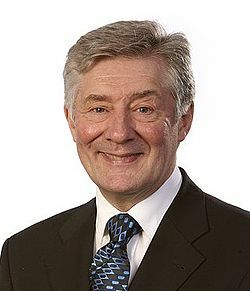 I’d like to congratulate Tony Lloyd who has already served us well as Police and Crime Commissioner and will continue to do so as Interim Mayor. A heartfelt thanks also goes to Lord Peter Smith as the Chair of the Combined Authority for the leadership and dedication he has shown, which has helped to get us so far. Let’s use this time well, engage the public and show the UK that devolution can be used to create a fairer economy – and one which benefits all communities.